A delicious combination of unexpected flavours, with sour, sweet and creamy coming together on one plate. 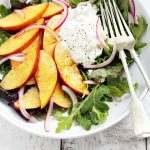 A great and different way to enjoy fresh peaches. 4 cups mixed greens Spring Mix, arugula, spinach etc. n a large bowl, combine vinegar and sugar. Add red onion slices with a little salt and pepper. Toss to combine. Allow to stand at room temperature about 10 minutes. Add peach slices and allow them to "pickle" for a bit as well. Let sit in vinegar from 1-5 minutes, depending on how pickled you'd like them. I think somewhere around 3 minutes gives a nice blend of sweet and sour. Drain off pickling liquid, reserving the liquid. Add greens to the bowl and drizzle with olive oil and about 2 Tbsp. of the reserved pickling liquid. Toss to combine. Place salad on plates and place pieces of burrata on top. Season with salt and pepper.